EPDM SINGLE PLY | Old Dominion Roofing & Construction, Inc.
One of the most popular low slope commercial roof installation solutions is EPDM roofing. EPDM stands for ethylene propylene diene terpolymer and is a durable rubber roofing membrane that has been used for decades. EPDM roofing is popular for a variety of reasons. First, it is impervious to so many outdoor elements that can pierce it, such as hail or debris. It can also handle cold environments with ease, even with temperatures in the negative 40s, which is more than ideal for the Virginia area’s varying temperatures. This helps to keep the surface from freezing. But it is also resistant to the ozone and heat as well. This makes it also a go-to solution to keeping out the sun’s harsh UV rays from making their way in a structure. For other poor weather conditions, EPDM has a high resistance to high winds–keeping the structure safe in inclement weather. This flexibility in temperatures also makes EPDM roofing a great solution for a settling environment. 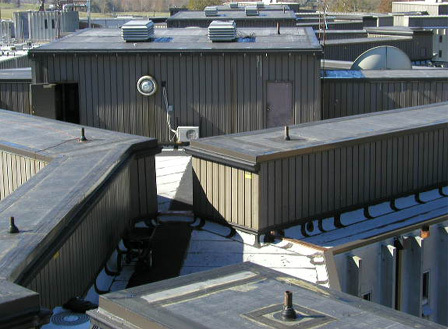 On average, with proper care, EPDM roofing membranes can last up to 40 years. With this type of return on investment, it is such a cost-effective solution that many have found to be a great return on investment, both in materials and in overall construction. Old Dominion Roofing & Construction, Inc. has been serving the commercial roofing needs of businesses across Virginia since 1984, so you can be sure you have found the right roofing company for your business. In the event you need a complete roofing system, our staff will provide you with a Quality Roofing Solution. We know commercial roofing!